As well as being able to handle some serious hauling duties thanks to its enormous four-ton payload,the World Cruiser also boasts a full kitchen, a bathroom, a dining area, a living room, and beds for six people. Its huge bulk is propelled by an appropriately large Cummings diesel engine producing a simply awesome 1,200 lb.-ft. of torque. This Ford F750 World Cruiser pick-up truck, with its full living room, kitchen, bathroom and beds for 6, was built by Dunkel Industries and cost $6m to build. That is a bargain price right? 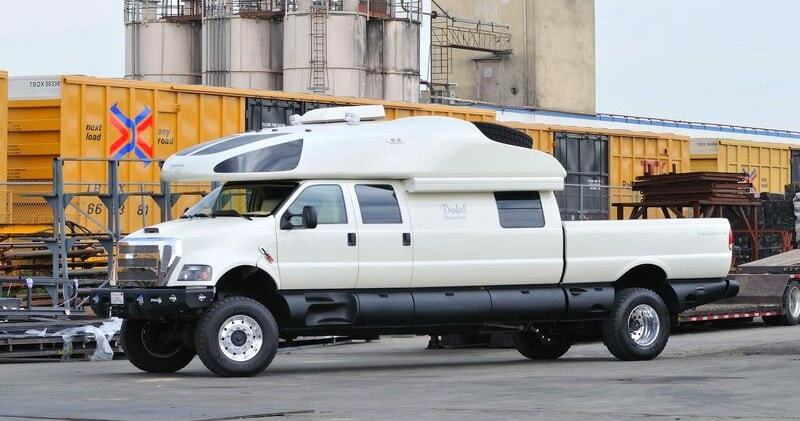 Well, this Ford F750 World Cruiser pickup truck has everything under the sun inside it. It is a house on wheels that can also haul a load of anything you can imagine.It has a full living room, kitchen, bathroom, and beds for six.